This is the early 80′s in the UK and Punk is dead and NWOBHM lumbers on and out of that dead sea rose MOURNBLADE who were hailed by Derek Oliver of Kerrang as “The Future of Heavy Metal!” After a chaotic start the band gigged the London club circuit to death, and later the regions throughout 1984 and 1985 alone clocking up no less than 400 shows including regular headlining slots at London’s MARQUEE, 100 CLUB and DINGWALLS. This Anthology is the first part of the band’s history from 1984 /85 offering classic tracks and rarities which is a great introduction to this much missed band and their music. This Anthology is a collection of early demos and live tracks taken from their 1984 / 1985 era, collected together here by one of the UK's most prestigious heritage labels, Angel Air Records. Mournblade's sound is a kind of cross of NWoBHM and 70's punk, but also heavily influenced by prog rock bands such as Hawkwind etc. Punk/metal and a dose of Hawkwind, that was apparently a new concept in the mid nineties...a fantastic trip in the time machine. Angel Air has established a pretty solid track record at being one of the best heritage labels around. Imagine a cross between the psychedelic, spacey keyboard driven sounds of Hawkwind or early Pink Floyd, mixed together with the Michael Moorcock Sci- Fi influenced musings of the annoying, snot nosed, John Lydon-like vocals of one Dunken Mullett, and that pretty much sums up Mournblade in a nutshell. With a name drawn from the books of renowned sci-fi writer Michael Moorcock their sound too owes much to the band who Moorcock is most associated with ... Hawkwind. Titles like "Servants of Fate", "Sidewinder/The Sorcerer" and almost inevitably "Science Fiction" are marked by strong similarity to the space-rock masters whilst the spacey guitars, keyboard swoops and sound effects are equally effective in identifying influences. Okay, ambition and ability sound unfortunately unmatched by available budget, but it's still a worthwhile listen with the band proving more than competent at what they were trying to achieve if devoid of something likely to announce their existence to the masses. Perhaps the world in the mid-80s just wasn't ready for two bands that sounded like Hawkwind? Later material from a rejigged line-up showed a distinct shift in style but that, as sleevenotes courtesy of GRTR! 's Joe Geesin indicate, will be revisited at a later date. 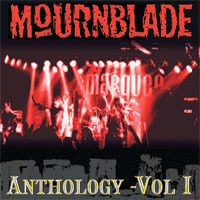 Mournblade's music is punked up NWOBHM which is somewhat bizarrely boosted by huge keyboards that add an air of Hawkwind majesty...Angel Air don't often get it wrong, with the vast majority of their vault plundering being of the highest standard.